I will be joining ISTE’s SIGVE and the IB Educators Guild in WoW in on an Hour of Code to celebrate Computer Science Week and to advocate for teaching coding at all grade levels. This will be at least my third official Hour of Code as I will be participating in an unplugged activity with my colleagues, during the same week. The Computer Science Education Week website offers tutorials and suggested activities to ensure for a problem solving, thinking event. The SIGVE event and IB Guild planned activities described below are ones that you will not find on code.org so I’ll provide a brief description for anyone wanting to join or develop their own Hour of Code. In Second Life a script is coded in a pop-up box and a HUD (Heads-Up Display) is often used to activate the commands coded. On Tuesday December 10, SIGVE (8PM EST) members will bring their avatars to SIGVE Headquarters in Second Life to write code that will program their avatar to animate. Educators attending will use the SL language along with animations to create a sequence of moves. Often those who use 3D immersive environments simply use purchased or gifted animations, this activity will provide an opportunity to customize avatar movements movements upon activation. There is always the possibility that the program will not work or will not work as intended, thus needing to be debugged. 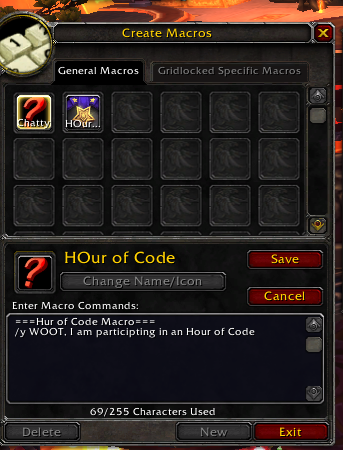 In WoW, Macros are written in a pop-up box and connected to icon/button that will then activate the commands when clicked. On Wednesday December 11, (8PM EST) The Inevitable Betrayal Educators Guild in World of Warcraft will spend an Hour of Code developing Macros that will animate characters, cast spells, use weapons, and make more efficient use of time. The guildies will use the slash commands used within the WoW game to write programs with a series of actions that will be activated with a button. Different classes within the MMORPG have skills and spells that are specific to that class, thus complicating things a bit and requiring a little more problem solving on the part of participants. The “programs” or Macros will be tested out in friendly duels and debugged as needed. The idea of the event is to promote computational thinking, which is an integral part of the CCSS and explicitly taught via Computer Science classes. The two opportunities offered by these educators will be live-streamed via the Gamemooc youtube channel so if you cannot attend, you may want to logon and watch the fun.